Rabbi Eli Sadan says first priority is uniting National Union and Jewish Home, other right-wing parties will take more time. 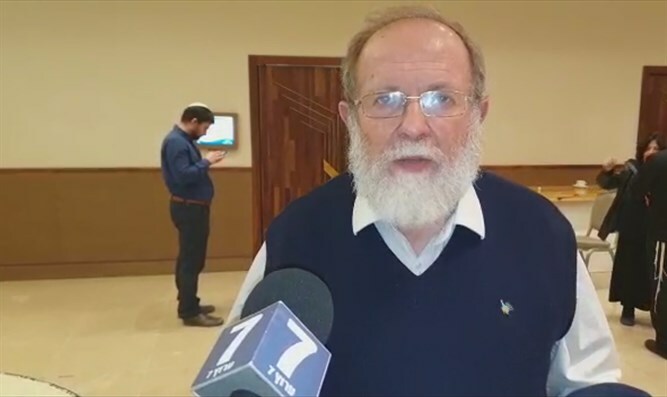 Rabbi Eli Sadan, one of the leaders of the Rabbinical Conference held in Jerusalem on Monday, called for the unification of religious right-wing parties. At the end of the meeting, Rabbi Sadan told Arutz Sheva that "it was a good meeting, it revealed the unity that exists in all shades of the rabbinical world. By unity we will achieve many good things." He said that the dispute between the Jewish Home and the National Union is not about who will head and who will accept the post of minister in the next government. "There are different forms of looking at reality and they are clear, and I assure you that if we wait patiently, they will reach understanding, unity and agreement." "The role that the rabbis have taken here is exactly the opposite: when there are sharp discussions in which different worldviews can be revealed, everyone should be reminded that the goal is to unite, and when everyone understands that the goal is to unite, then the goal will be achieved. In response to the question of whether the union should include both Otzma Yehudit and Eli Yishai's Yachad party, Rabbi Sadan said: "Slowly, we are first of all [working on unifying] the Jewish home and the National Union. These are two parties whose difference is semantic, That there is no doubt that unity is power, but when there is an artificial unity, it can create problems later on." "I think we have to manage a little bit. After we succeed in reaching unity in the natural home, there is no doubt and I assume that this will happen, that people whose job is to strengthen our political world have contacted other forces that will want to unite with us. Rabbi Sadan refused to answer a question about the nature of his recent meetings with Prime Minister Binyamin Netanyahu, and refused to comment on the possibility of the Jewish Home party joining the Likud party.